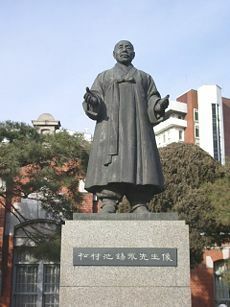 Statue of Ji Seokyeong in front of Daehan Medical Academy. Ji Seokyeong (1855-1935) was a late Joseon period physician, as well as a civil minister and Hangeul scholar. He studied vaccinations and worked to educate people about their value, contributing greatly to the elimination of smallpox in Korea. He was the earliest Korean physician to administer vaccinations, and there is still much about his life and work that is unknown. He also worked tirelessly to promote the use of Hangeul, campaigning for wider literacy and education among the Korean population. Ji traveled to Japan and consulted with Japanese colleagues in order to further his knowledge. Later this proved to cause him difficulties as anti-Japanese sentiment increased in Korea. He dedicated his life to improving the lives of the Korean people through better medical care and literacy, and chose to retire in 1910 at the age of 55 when the Japanese annexed Korea, not wanting to continue his job as dean of the government medical school under Japanese governance. Ji Seokyeong was born on May 15, 1855, in the city of Hanseong (now Seoul), the fourth son of Ji Ikyeong (지익용, 池翼龍) an oriental medicine physician. From an early age, he became interested in translations of western medical journals that came to Korea from China, and became interested in the work of the English doctor Edward Jenner, who was the first to administer the smallpox vaccination. In 1876 he met Pak Yongson, who had recently participated as translator for Kim Kisu in a diplomatic mission to observe Japan's modernization, under the terms of the Korean-Japanese Treaty of Amity. Knowing that Ji was interested in inoculation, Pak told Ji about Japan's advances in inoculation, and gave him a set of books on the topic that he had brought back, Jongdu Guigam (종두귀감, 種痘龜鑑, Models of Inoculation) written by Dr. Odaki of Suncheondang Clinic in Tokyo. Having been interested in inoculations since an early age, and sorry that so many people were dying from infectious diseases, Ji began to undertake research to try to develop vaccinations. Particularly he worked to fight smallpox, the most dangerous infectious disease facing late nineteenth-century Korea. Unable to create effective inoculations on his own, in 1879, he traveled to Pusan to study inoculation at the Japanese Naval Hospital. Completing his studies, he received some vaccine from the Hospital, and on the way back to Seoul he stopped at his wife's hometown in Chungjugun Deoksanmyeon and inoculated 40 children of her relatives and neighbors against smallpox, the first inoculations to be administered in Korea. Arriving in Seoul, he vaccinated many children, working out of his house. However, since the vaccine he had brought with him from Busan could only treat a limited number of people, he determined to manufacture the vaccine on his own. In 1880 Ji learned another diplomatic mission to Japan was being planned, and requested to join the staff, hoping to have a chance to learn about manufacturing vaccine during the Japan visit. The head of the Korean mission, Kim Hongjip, made a request on Ji's behalf to Japan's Foreign Affairs Minister Inoue, and Minister Inoue arranged for Ji to be introduced to the director of the vaccine department. In Japan, Ji studied the production and storage of vaccines. After he had mastered his studies on the production and administration of the vaccine, he brought 50 vials of vaccine back to Korea with him and returning to Seoul, he continued to administer vaccinations. In the late nineteenth-century Joseon Korea there was rising tension regarding Japanese influence in Korea. In 1882, during the Military Mutiny of 1882, or Imo Kullan, a Japanese military training officer was killed, and the Hanabusa, the head of the Japanese mission in Korea was also attacked. In the aftermath, Koreans like Ji Seokyeong who had close ties to Japan came under suspicion of being too sympathetic to Japan. He was injured and almost died when his clinic was destroyed by fire. Under threat of arrest, Ji was forced to leave Seoul for a while. In August he returned to Seoul and rebuilt the clinic, and in September he traveled south at the request of the governor of Jeolla province, to establish vaccination clinics in Jeonju and to instruct physicians on how to administer the vaccine. The following year, he continued to encourage smallpox vaccinations throughout the country, establishing another clinic in Gongju, at the request of the governor of Chungcheong Province, he established another clinic in Gongju. The Daehan Medical Hospital, opened in 1908, where Ji Seokyeong was the founding Dean. Now part of Seoul National University School of Medicine. Ji Seokyeong passed the civil service examination in 1883, and was appointed as an instructor of Confucian precepts in the National University (관립대학교, 官立大學校). He began work on a book on inoculations, finally completing two volumes including important essays on inoculation by English, Chinese and Japanese pioneers in the field. The work, entitled New Principals of Inoculation, (Jongdu Sinseol, 종두신설, 種痘新說), was published in 1885. Following the Kapsin Cheongbyeon or Coup d'Etat of 1884, again his association with Japan placed Ji Seokyeong under suspicion; he was accused of being a member of the Independence Party, a party with close Japanese ties. In 1887 he was arrested and sent to exile in Sinjido, an island off the coast of Jeolla province. During his time in exile, he continued to teach, and finally in 1893, was able to return to Seoul, he established the Wuduboyeongdang (우두보영당, 牛痘保嬰堂) clinic, where he continued inoculating children and training doctors. Based on his qualification from the civil service exam in 1883, Ji Seokyeong was appointed to a district chief post near Pusan in 1891, where he served for a time. In 1899, the government opened the Euhakkyo (의학교, 醫學校), school of medicine, under Ji Seokyeong's direction, and he held the post of Dean for ten years, focusing on teaching medicine from a scientific approach. In 1908, he took the position of Dean at the newly established Daehan Medical Academy (대한의원교육부, 大韓醫院敎育部). Ji Seokyeong is best known for his work in the field of medicine, especially vaccination against smallpox. However, he was also active in promoting the use of hangeul, to increase educational opportunities for a greater portion of the population. Despite the fact that Hangeul, a new phonetic alphabet for writing Korean had been developed under the leadership of King Sejong centuries before, even during the nineteenth century the vast majority of published works in the Korean language continued to be written with Hanmun (Chinese characters), which could only be read by the aristocracy. Ji Seokyeong actively advocated abandoning Hanmun in favor of Hangeul, and in February of 1908, he was appointed head of the Korean Language Institute (Kukmunyeonguso, 국문연구소, 國文硏究所). Under Ji's direction, the following year, the institute published a dictionary of Chinese characters, Chajeon Seogyeo (자전석요, 字典釋要) written in Hangeul. Hangeul Hanmun Dictionary published in 1910 by Ji Seokyeong. In recognition of his efforts on behalf of the Korean people, the Korean Imperial government awarded him the Palgwehunjang (팔괘훈장, 八卦勳章) and Taegukhunjang (태극훈장, 太極勳章) followed by the 4th class honor (팔괘장, 八卦章) in June of 1910. Two months later, Korea was annexed by Japan, the Korean Empire was dissolved and the country came under the control of the Japanese occupation government. It was difficult for a patriot like Ji to endure the humiliation of Japanese rule on his country, and later the same year, he resigned from his position as Dean of the Daehan Medical Academy. The Japanese Governor urged him to continue as the Dean of Daehan, but Ji refused, choosing to retire to the countryside, where he lived until his death on February 1, 1935. Ji Seokyeong is credited with introducing and promoting the smallpox vaccination to Korea, as well as promulgating the use of Hangeul for written Korean during the early twentieth century. His son, Ji Seongju attended the Gyeongseong Medical School, which developed from the Euhakkyo founded by Ji in 1899, graduating in 1919, and where he had great success as a physician after taking over his father's medical practice in Nagwon-dong. Ji's grandson Ji Hongchang also graduated from Gyeongseong Medical School in 1949 and became a well-known army surgeon, and served as the personal physician for the president. Ji Hongchang's eldest son Ji Muyeong graduated from Catholic University School of Medicine and also began working as a physician. Shin DW. 2004. Western medicine, Korean government, and imperialism in late nineteenth-century Korea: The cases of the Choson government hospital and smallpox vaccination. Historia Scientiarum: International Journal of the History of Science Society of Japan. 13 (3): 164-75. This page was last modified on 9 May 2014, at 14:28.